Yes, the rumors are true and we are currently looking to fulfill two positions at this time! Here is a more in depth look at what these two positions are and their job duties. 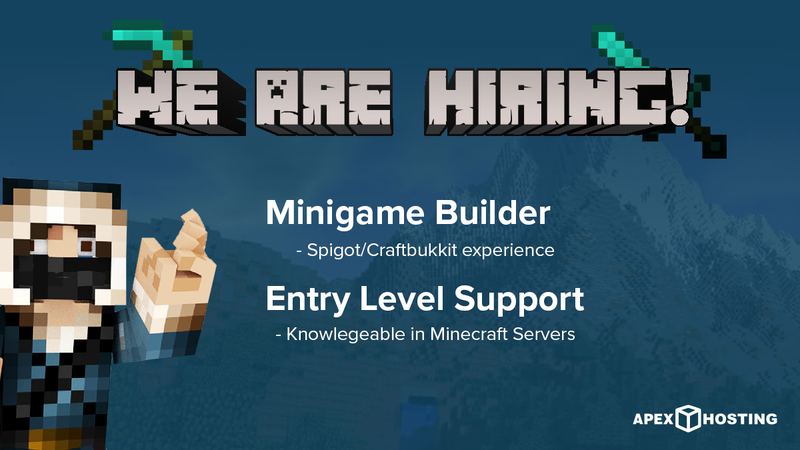 Entry Level Support: Knowledgeable about Minecraft servers and their inner workings. The ideal Support rep has nearly countless hours of play time and experience with various plugins, mods, and server setups. If you know how to trouble shoot plugin conflicts, mod errors, and bungee servers then you’re our ideal candidate. This position requires a high activity on our live support chat, active participation in non-billing related support tickets, and a positive attitude. Mini Game Builder: This person will be responsible for creating and building fully fledged game types through the use of plugins. You will create ranks, shops, games and more for clients to play on their server. Spigot/Craftbukkit experience with using plugins and configuring them required to make a cohesive game play experience. If you think you have what it takes then make sure to head on over here to apply. We can’t wait to go over your applications and wish you all the best of luck!